General International 10" Helical head jointer. guard after the wood has passed through, it did not really work so good so I preloaded the spring a little and sprayed a little WD-40 on the pin and everything worked fine. Seems to be a great machine and I am very happy with it. Look how clean your shop is, I wish I could keep my so clean. You have some nice machines, I upgraded to a 8” jointer and I love it, but there are times I wish it was just a little bit bigger. I have a question for you, I noticed that alot the CA woodworkers use General int. 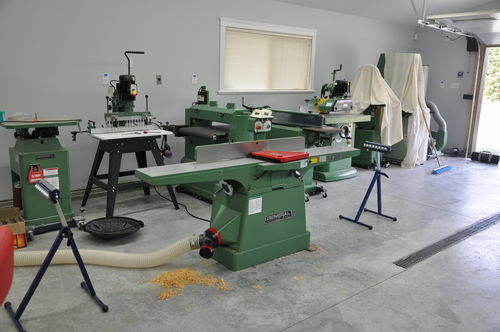 Machines, and I was looking at that General Dual Drum sander you have in the back ground How do you like it? How well does the helical head work on knotholes, reversing grain, and other weird figure? This jointer is model #80-250 XHCM1 I just got this jointer a short time ago and the first time I used it was July 9th, and actually thats the first time I ever used a jointer. It seems to be a great machine everything basically set up right out of the crate., all I really had to set up was the fence. The Douglas Fir I milled up for table tops has quite a few knots in it, a mixture of both small and large. The head had no issues with them at all, and there is also some weird grain in the wood also,I had no tear out at all, really impressed. As for my General International double drum sander Model # 15-250 I have not used it yet but will post a review as soon as I do.